Opportunity cost of management time and energy wasted on dealing with the receivable. Goodwill lost with the client and an increased likelihood the client will speak negatively about your company or will refuse to buy again. Line of credit interest expense to fund operations during the non-payment period. Potential of maxing out the line of credit limit which creates a cash shortage and additional management stress. Wage expense for a bookkeeper to send out statements and potentially revise invoices. Cost of CFO and year-end financial statement auditor to analyze collectability of accounts. Implement a paradigm shift on deposits: A properly implemented down payment program can literally drive receivables negative. As a bonus, a down payment requirement helps screen customers who may not pay you in the end anyway. Create a culture of explaining terms: Sales teams sell, but are notoriously poor at explaining payment expectations up front to customers. It must be ingrained into company culture by management and flow from the sales manager down. Make rework an emergency: Quite often, non-payment has its roots in client dissatisfaction. Because of that, one key way to avoid overdue receivables is to treat rework as a near-emergency. Assign the right person to look at AR daily: Yes, daily. And you'll have to find the "way" the client communicates. Rethink early payment terms: If you do steps 1–4 above correctly, perhaps you will not need early payment terms. However, most successful companies offer a discount if a client pays an invoice within a short time period (typically 10 days). Use trade notes: Often, non-paying customers have cash flow issues. Rather than continuing to "beat a dead horse" by making endless calls or visits, when it gets to that point it often works best to cut over to a trade note (basically a formal loan). It is quite common for companies to allow receivables to slip through the cracks. In many cases, there is no one who diligently monitors or even truly cares about the receivable balances. Everybody in the organization needs to understand and care about receivables. Most of the steps to eliminating overdue receivables also align with the steps of running a business well and treating people fairly and respectfully. Diligent implementation of these steps will therefore not only reduce receivables but also put your company in a position of strength moving forward. $1,000,000 in receivables on monthly sales of $1,250,000. Average of 25 days sales in receivables. $60,000 of the receivables were 90+ days past invoice date. $625,000 in receivables on monthly sales of $1,300,000, or 14 days sales in receivables. Only $3,000 of the receivables were 90+ days past invoice date. $45,000 of old receivables had been converted to trade notes that were faithfully being paid down and carried a total remaining balance of $39,000. 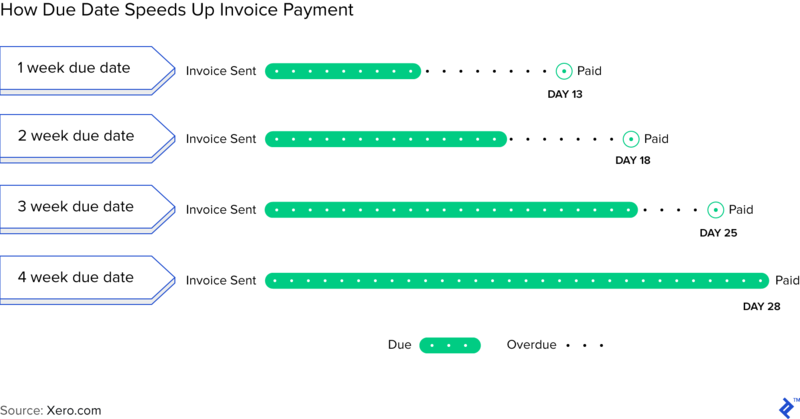 Before getting to the answer, I’d like to suggest that overdue receivables are one of the most common and serious frustrations entrepreneurs face–and one of the most easily avoidable. In my work as a freelance CFO, I cannot begin to count how many receivables I’ve seen go bad. If you’ve been in any size of business for any length of time, you know what I’m talking about. Company salesperson makes a sale to a client with little emphasis on payment terms. Company delivers product or service, but the delivery is behind schedule or the final product does not meet client expectations. Client withholds all payment until the product or service is improved to perfection. Management of the company becomes frustrated that the client is using non-payment to hold them hostage until the rework is done. Tense words are exchanged between the company and the client. Situation descends into a black hole of mutual disrespect. Original invoice begins to get stale on the AR aging schedule. CFO notices the overdue receivable during month end financial review and mentions to management. Unless you are in the upper 95th percentile of companies, this is a list you could about recite back to me in your sleep. Speak negatively of your company to others. This is not a complete list. The negativity and cynicism that often stems from receivables conflict can have a real impact on the mood of management and the company. The effect of this and other intangibles makes it very difficult to truly quantify the full cost, but it’s probably higher than most entrepreneurs imagine. How exactly did my client (and the select group of mid-sized companies who are like them) rein in receivables and put themselves on a better path? The concept sounds simple, but I am amazed at the number of entrepreneurs who do not see how upfront deposits could work in their industry. Down payments work in accounting, construction, retail, healthcare…virtually any situation you can think of. But it takes a management team committed to the concept and a sales team confident enough to simply “ask for money”. A properly implemented down payment program can literally drive receivables negative. Yes, you read that correctly. There are many businesses that collect more cash than they’ve delivered product or services for. The customer down payments serve as a line of credit that keeps the company cash positive. That is an extreme case of reining in receivables, but not out of reach in many situations. As a bonus, a down payment requirement helps screen customers who may not pay you in the end anyway. It also takes a qualified customer “off the market” because once people have written even a small check, they are far less likely to keep shopping around. Create a culture of explaining terms. Sales teams sell. They are compensated for selling. Often that compensation is based on deals closed (not sales delivered or collected on). The focus is on getting clients to sign on the dotted line. However, an emphasis on securing sales can result in ignoring a critical key to collections: Explaining payment expectations up front to the customer. The client has the ability to pay. The people who control the funds at the client are aware of the terms and in agreement with them. The client understands that the order will not proceed unless the terms are met. Salespeople are notoriously poor at these tasks, to the point that it could make sense to let someone else handle this part of the transaction. However, experience has taught me it works better when the salesperson does it. They are familiar with the client and are best positioned to find the right moment to make the payment terms clear. They can also reinforce the terms along the way. It must be ingrained into company culture by management and this expectation must flow from the sales manager all the way to the newest sales intern. Every sales team member needs to live with a slight dread of closing a deal without this discussion. Make rework an emergency. Quite often, non-payment has its roots in client dissatisfaction. This is particularly true for companies in industries like construction, manufacturing and custom retail. Because of that, one key way to avoid overdue receivables is to treat rework as a near-emergency. This requires a culture shift that involves the entire company, not just the sales team. For example, in a production setting, the shop supervisor and production workers need to be aware that rework jobs take priority. The entire shop workforce also needs to understand that quality control isn’t just about getting things right the first time–it’s about getting paid. I once worked with a manufacturer who had a “stop the presses” approach to rework. When the product came back for any reason, the shop knew that job was first in line to get rebuilt. When clients see effort going into making them happy it helps lessen the pain of dissatisfaction. The extra effort also shortens the period the client is without the product or service they ordered. Both will have a dramatic effect on payment. Assign the right person to look at AR daily. Yes, daily. And surprisingly, it doesn’t have to be the bookkeeper or sales manager or an owner. I worked with a company who had a delivery man who took on the collections role and did a great job. He would go meet customers, talk with them, and collect overdue money. The client at the beginning of this article had a person with an incredible approach to collections. She kept track daily of what money came in and what remained to be collected. She made contact (mostly calls) daily as needed to keep money flowing. The other thing I learned from her was the exact procedure for drawing money out of slow payers. She would call them and just talk. She asked about them and their business and found out how things were going. Eventually (and she took her time) she would bring up their invoice and ask when it would be paid. Invariably, they would say something like, “well we have a customer paying us Thursday and after that, we’ll put a check in the mail.” After hearing a comment like that, most people would let it go and hope the check comes as promised. Not her. She kept meticulous notes and would call on the very day they had said their customer was paying them. If their customer still hadn’t paid, she would call back the next day, simply holding the client to what they said they would do. People intrinsically do want to keep their word, and she encouraged that by faithfully reminding them of their commitment. With this incessant follow up, they not only paid their overdue bill but often paid timely in the future to avoid the rigmarole. One key observation on this: You have to find the “way” the client communicates. Some clients work by email, some by phone, some with text messages, etc. Don’t make the mistake of using your company’s preferred method of communication and expecting the client to respond. Rethink early payment terms. If you do steps 1–4 correctly, perhaps you will not need early payment terms. However, in my experience, most successful companies offer a discount if a client pays an invoice within a short time period (typically 10 days). These discounts can have a dramatic impact on days sales in receivables. The client I referenced in the beginning saw their receivables drop 40% within several months of implementing a 2% discount if paid by within 10 days. That gave the checking account a one-time pop of about $400,000. If you do the math, a 1 or 2% discount for payment in 10 days is a very steep fee to pay for having money in your pocket a few days early. However, as we discussed earlier, overdue receivables come with steep costs too, which is why many companies choose to pay the steep fee to avoid them altogether. One client I worked for offered a 3% discount if the client paid in full at the beginning of the project. If it had only been about the time value of money, it would have been a very stupid proposition. But it wasn’t just about the money. This company sold a highly custom product, and invariably their clients had at least one unmet expectation when the product was delivered. By taking cash collection out of the equation upfront, it removed the risk of tainting the client relationship by asking for payment in the middle of the rework phase. A word of caution: short due dates without early pay discounts can make you look aggressive and unreasonable, especially in certain industries. As you decide on a due date, consider how you would feel if you received your own invoice. Use trade notes. Often, non-paying customers have cash flow issues. Rather than continuing to “beat a dead horse” by making endless calls or visits, when it gets to that point it often works best to cut over to a trade note (basically a formal loan). I think of one my clients who had a customer seven years ago who owed them $100,000. My client agreed to a payment plan and the owners of the non-paying company (which went out of business) have continued to chip away at the balance to this day. Through small monthly payments, combined with a few bigger pay-downs, the balance is now down around $20,000. If my client had pushed them hard for the whole sum at once or threatened legal action, I’m guessing most of the $100,000 would eventually have been written off. This method was a tool my client in the opening example used to collect several large >90-day receivables. They moved stale balances out of A/R into notes receivables and started collecting moderate monthly payments (often around $1,000 per month) complete with a reasonable interest charge. It took about 3 years to whittle the balances down to $0, but in the end, virtually everything was collected. And by implementing some of Steps 1-5, there were no new stale receivables to take the place of the paid ones. Always meet in person to discuss and sign the paperwork, if possible. Drive 3 hours if you have to. Ask the client what monthly payment amount will work. Push them up a little, but not much. They have to be able to actually make the payment. Require auto-withdrawals or pre-authorized credit card transactions. The client has already proven they can’t send in a check; remove this roadblock for them. Charge (reasonable) interest. If it is a sticking point, you could annually agree to apply the interest to the principal balance if they faithfully make the payments during the year. Most businesses, though, are fine with a reasonable interest charge. Make sure you leave the meeting with a signed note and SOME MONEY. Even if it’s $25, the deal won’t be real to the client unless they part with hard cash. Very likely they can at least pay $250 or $500, or even a much larger amount depending on the overdue balance and size of the company. It is quite common for companies to allow receivables to slip through the cracks. In some cases, there is no one who diligently monitors or even truly cares about the receivable balances. If someone does care (usually an owner) they feel (often rightly so) they are the only one who does. Which leads me to the summary point: Everybody in the organization needs to understand and care about accounts receivable management. It is helpful to remind employees that customers, not the company, write employee paychecks. Each employee must clearly understand the direct line between their actions and timely payment by the customer. What is an accounts receivable aging schedule? An accounts receivable aging schedule groups invoices in columns based on how far they are overdue. For example, the first column might show invoices 1-30 days overdue, the next column 31-60 days overdue, and the next 61-90 days. How do you avoid overdue accounts? One major key is communication with the customer before the account is seriously overdue. Often the customer is not paying for a reason and it is important to find out what that reason is and address it. The accounts receivable process is the set of steps required to invoice a customer and receive payment of the invoice. The accounts receivable process typically includes entering the invoice and payment in the accounting system. Very sensible tips on a seriously under-rated topic.. Well done. S. Sivaraman, thanks for the feedback. Always appreciated!